The past decades have brought startling advances in our understanding of endocrinology. Of paramount importance is the large increase in the number of legitimate hormones, which now number more than 100, as well as the application of the modern concepts and methodologies of biochemistry and molecular biology to endocrinological research. It is now feasible to approach virtually all classical topics in endocrinology at the cellular and molecular levels. This book provides a comprehensive treatment of human hormones viewed in the light of modern theories of hormone action and in the context of our current understanding of subcellular and cellular architecture and classical organ physiology. The book is intended for use by first-year medical students, graduate students, and advanced undergraduates in the biological sciences. Also, physicians-in-training should be cognizant of new insights into the etiology of endocrine-related diseases and appreciative of the contribution of basic science to the development of new treatments which are possible through the application of molecular biology and biochemistry to the classic domain of endocrinology. For example, who could have predicted a decade ago that hormonal receptors, or components of hormonal receptors, as well as key cell growth factors could be associated with oncogenes and the cellular expression of certain forms of cancer? Increasingly, medical school curricula are being revised to include a significant coverage of molecular endocrinology. The curriculum for advanced undergraduate biology majors is also being expanded to include molecular endocrinology. Graduate students in medical or biological sciences, including immunology, entomology, genetics, anatomy, physiology, and biochemistry, will inevitably encounter, either in the classroom or in excursions into the modern scientific literature, the contributions and impact of modern endocrinology. It is hoped that this book will fill the void that currently exists for resource materials for teaching cellular and molecular endocrinology and that it will be employed as an equal partner with most standard biochemistry textbooks to provide a comprehensive and balanced coverage of this realm of biology. Our book presumes that the reader will have been exposed in detail to the fundamental areas of biochemistry, including enzymology and the structure and function of macromolecules and the other bioorganic substances of intermediary metabolism, as well as to selected topics in molecular biology. In addition, an understanding of cell biology, cellular and subcellular organization, and mammalian physiology will be useful. It is the tetrad of biochemistry, molecular biology, and cell and organ physiology that provides the principles and biological "facts of life" that are critical to our modern understanding of hormones. The book provides two introductory chapters followed by seventeen chapters on selected endocrinological topics pertinent to humans. The first chapter presents the first principles of hormone action. These include a discussion of the structural and functional classification of hormones and a detailed presentation of current general theories of mechanisms of hormone action at both the cellular and subcellular levels. Chapter 2 provides a detailed presentation of the seven classes of steroid hormones and their chemistry, biosynthesis, and metabolism. 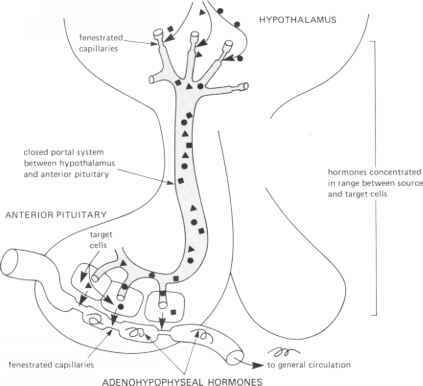 These introductory chapters are followed by sixteen chapters that address either a classical endocrine system—e.g., hypothalamic hormones (Chapter 3), posterior pituitary hormones (Chapter 4), anterior pituitary hormones (Chapter 5), thyroid hormones (Chapter 6), pancreatic hormones (Chapter 7), gastrointestinal hormones (Chapter 8), calcium-regulating hormones (Chapter 9), adrenal cor-ticoids (Chapter 10), hormones of the adrenal medulla (Chapter 11), androgens (Chapter 12), estrogens and progestins (Chapter 13), and hormones of pregnancy and lactation (Chapter 14)—or newer domains of hormone action which are now essential to a comprehensive understanding of hormone action, including prostaglandins (Chapter 16), thymus hormones (Chapter 17), and pineal hormones (Chapter 18). The book concludes (Chapter 19) with a presentation of hormones of the future, i.e., cell growth factors. Chapter 15, Hormones of the Kidney, of necessity is not devoted exclusively to a single hormone system; it focuses on the hormones, excluding 1,25-dihydroxy-vitamin D (Chapter 9), which are made in (erythropoietin, kalli-kreins) or which act (aldosterone, vasopressin) on the kidney. Each of the last seventeen chapters is organized in parallel fashion. Thus, each chapter has the following sections: (a) introduction; (b) human anatomical-morphological relationships; (c) chemistry; (d) biochemistry; (e) biological and molecular action of the hormone(s); (f) clinical aspects; and (g) reference citations. The clinical aspects section is not intended to be comprehensive, but rather to provide for the medical student an introduction/resume of key disease states and contemporary medical problems related to the hormone(s) deficiency or excess. In addition, Appendixes C and D provide insight into the definition and incidence rate of prominent endocrine-related disease states. Each chapter is highly illustrated with respect both to human physiology and anatomy and to the details and models of hormone action. Each chapter culminates with a listing of key reference citations, including books and review articles as well as recent research papers. The book also contains eight appendixes: (A) a table listing over 100 hormones; (B) a table of the blood concentrations of major hormones; (C) a list of prominent endocrine disorders; (D) a table of the rate of incidence of principal endocrine disease diagnoses; (E) a tabulation of Nobel Prizes awarded in endocrinology and related areas; (F) a table of the genetic code; (G) a table of the three-letter and single-letter abbreviations for amino acids; and (H) a tabulation of the units of scientific measurement. nucleotides). The dilemma to the authors was whether to include such extensive and detailed information in a volume that is intended for use as a textbook. Clearly, most students will not study protein amino acid sequences or cDNA sequence at the individual amino acid or nucleotide level. Yet we feel it instructive for the student to realize and appreciate the intrinsic complexity and detail of information pertaining to hormones which molecular endocrinologists can now almost routinely achieve. Accordingly, the authors have included many sequences of large peptide hormones as well as cDNA sequences. We have chosen in some instances to limit their format to a single-page "mini-print" rather than to extend their presentation over two or three pages. Interested readers should utilize a magnifying or "reading" glass to facilitate their study (e.g., see Figs. 5-4,5-7, 7-13,10-16A, 10-20B, and 13-15). The text is related to biochemical endocrinology courses we have taught to first-year medical students and graduate students at the University of California at Riverside and Temple University. The authors hope that the uniform organization of the chapters and the subdivision of topics within each chapter will allow instructors to select the level of coverage they require from a comprehensive presentation to one focusing on only the subcellular mode of action of the hormones. We would like to acknowledge the students at UC Riverside in Biochemistry 120 who used a draft of this textbook. From their comments and from our co-instructors, Professors H. L. Henry and R. A. Lüben, we received much useful feedback. (18). We thank Dr. A. Geoffrey Norman, Dr. Valerie Leathers, and Dr. Helen L. Henry, who all read major portions of the manuscript and provided essential feedback. If our book has merit it is due largely to the contributions of our scientific mentors and colleagues as well as those individuals who read various sections of the manuscript. Shortcomings still remaining are, of course, completely the responsibility of the authors. We are also indebted to numerous authors and publishers for permission to reproduce figures and tables that were originally published elsewhere. In particular we recognize the masterful skill of Dr. Thomas Lentz and thank the publisher W. B. Saunders for allowing us to utilize numerous of his outstanding line drawings (based on electron micrographs) taken from his book Cell Fine Structure. Thanks are also due to Dr. Laurie Paavola of the Department of Anatomy, Temple University School of Medicine, who allowed us to reproduce several of her own drawings of various cells and their morphological components in relation to hormone function. The authors have been privileged to utilize the skills of Ms. Patti Mote, a scientific illustrator, who prepared original line drawings or anatomical ink washes for approximately 120 of the 442 figures published in the book. Throughout the entire publication process, Ms.
Mote was always a positive force striving for simplicity, accuracy, and clarity in our illustrations. Also, the authors have been fortunate to have the services of a series of dedicated, loyal, and patient secretaries over the 6 years in which the typescript was being written or revised. In the early phases this included Ms. Sherry Bataglia, Ms. Cassie Wooten, Ms. Marcia Johnson, Ms. Pam Moore, and Ms. Jerri Flagg, and in the latter phases Mrs. Sharon Herbert, Mrs. Ann Hall, Mrs. Grace Jones, and Mrs. Lean Gill (who retyped several cDNA sequences). We thank you all! The authors are also indebted to the production staff of Academic Press for their professional assistance during this project. Finally, we express appreciation to our families in Philadelphia (Ellie, Geoffrey, Kate, Claudia, David, and Debbie) and in Riverside (Helen, Thea, Jacqueline, and Derek) who were most understanding of the long hours and absence from home that were required to produce the final manuscript.